The UAE projected a picture of New Zealand Prime Minister Jacinda Ardern on the Burj Khalifa, as a token of their appreciation for her support and empathy towards the Muslim community. 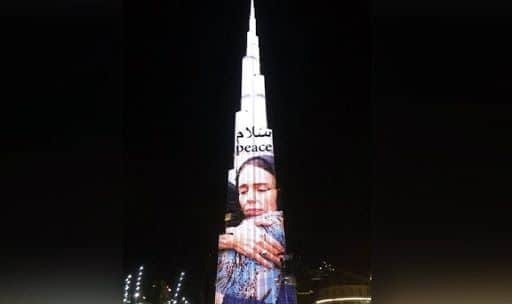 New Delhi: As a gesture of appreciation for the empathetic support to the Muslim community in New Zealand, the UAE projected Jacinda Arden’s hijab-clad picture wherein she is hugging a woman in grief, on the Burj Khalifa, world’s tallest building. Jacinda Ardern is New Zealand’s Prime Minister. Meanwhile, the New Zealand government banned military-style semi-automatic guns and assault rilfes, six days after a lone wolf attack in Christchurch claimed lives of 50 Muslims. Muslims offering prayers in mosques on March 15, Friday, were targeted by a white supremacist terrorist, named Brenton Tarrant- who opened fire at the worshippers. Tarrant also live-streamed his gruesome act on Facebook for 17 minutes and police believe that the accused had single-handedly carried out the terror attack at both the mosques under a span of 36 minutes during the Friday prayers for which a large number of worshippers had congregated. Several New Zealanders also participated in Headscarves for Harmony campaign on Friday, wherein women wore headscarves and men donned shawls on their shoulders in bid to stand in solidarity with the Muslim community. In addition, a two-minute silence was also observed in the country on Friday.